WAIPA IN REAL LIFE: ANOTHER WONDERFUL WEEKEND IN ANCHORAGE, ALASKA!!! BEFORE I HEADED OUT TO ANCHORAGE, ALASKA... AFTER I GOT OFF FROM WORK AT BYF AT 8:00AM, I WENT AHEAD AND STARTED MY "INTERVAL JOGGING". THAT MORNING IT WAS CHILLY THAN USUAL... 16 DEGREES WITH WINDCHILLS DOWN TO 5 DEGREES!!! BUT I STILL MANAGED TO FINSIHED MY RUN, MY HANDS WERE NUMB AND MY IPHONE WENT INTO SLEEP MODE BECAUSE IT WAS TOO COLD, WHICH MEANT NO MUSIC FOR THE LAST HALF MILE... LOL!!! BUT HEY, I'M A SPARTAN WARRIOR AND I DON'T STOP UNTIL I CROSSED THE FINISHED LINE!!! AFTER MY RUN, I HEADED STRAIGHT HOME AND GOT READY FOR MY WEEKEND TRIP!!! MMM... YUMMY FRESH BEETS SALAD!!! COSTCO... YOU GOTTA LOVE THEM FOR THEIR INEXPENSIVE GOODS!!! I GOT MY "CLEAN FOODS" FOR THE NEXT 2 WEEKS... AND MY PEANUT BUTTER... LOL!!! SPORTS AUTHORITY... IT WAS MY LUCKY DAY BECAUSE THEY HAD A HUGE CLEARANCE SALE!!! SO I STRUCK GOLD!!! I GOT AN AWESOME PAIR OF MY FAVORITE BRAND OF SHOES, "ASICS" TRAIL RUNNING SHOES, I ALSO GOT "HEAVY ROPES" FOR MY CARDIO & ENDURANCE TRAINING, AND I ALSO GOT A "PULL-UP" ASSISTANT BAND TO IMPROVE MY PULL-UPS AND UPPER BODY STRENGTH!!! I CAN'T WAIT TO START MY "SPARTAN TRAINING!!!" AND LAST BUT NOT LEAST, I HEADED OVER TO "BESTBUY" TO GET MY EARPHONES FOR MY RUNNING AND OTHER OUTDOOR TRAINING AND ACTIVITIES!!! AFTER I GOT MY SHOPPING DONE, I WAS STARVING AND IT WAS TIME TO GET MY GRINDZ ON!!! 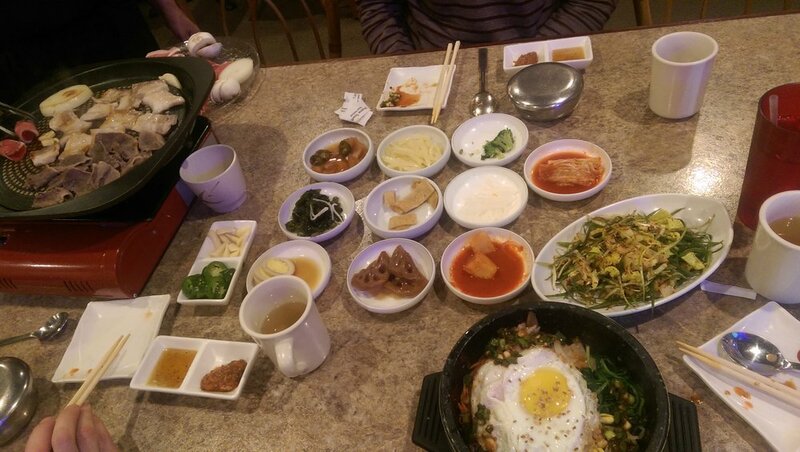 MY SISTER WANTED TO EAT KOREAN FOODS AND SO THATS WHERE WE HEADED TO. THE FOODS WAS SO GOOD AND PLENTIFUL!!! THEY EVEN HAD TABLE TOP COOKING!!! I HIGHLY RECCOMEND THIS PLACE IF YOU ARE A INTO KOREAN FOODS!!! I ATE WAY TOO MUCH THAT I FELL ASLEEP AS SOON AS I GOT TO MY SISTER'S HOUSE... LOL!!! THANK YOU DENISE AND VANG FOR HAVING ME OVER FOR THE SHORT WEEKEND, IT WAS SO SHORT BUT VERY FUN AND YUMMY!!! UNTIL NEXT WEEKEND, I'LL BE BACK!!! ITS MY ZUMBA FITNESS INSTRUCTOR, CINDI AND HER BEAUTIFUL DAUGHTER!!! SHE WAS ALSO KAHEALANI'S PEDIATRICIAN!!! ALOHA CINDI, IT WAS SO GOOD TO SEE YOU AND YOUR DAUGHTER IS SO PRECIOUS!! !